Sealegs Amphibious Boats can travel on land and can be parked like a car in addition to being used as speed boats. Sealegs Amphibious Boats are bound to be an attraction in water sports tourist spots. Sealegs amphibious boats are going to be displayed for the first time in the United States at the Fort Lauderdale International Boat Show from October 30 to November 03, 2008. Free demonstrations of Sealegs amphibious boats will also be available. a product of Auckland, New Zealand. on land: Sealegs is driven hydraulically by a 16 hp, Honda, 2 cylinder, 4 stroke air-cooled motor, which uses the same petrol as the outboard. Can move in reverse direction also. Being air cooled engine, can not be run for more than 10 minutes continuously. are equipped with retractable wheels like that of an aircraft and can safely move on a beach and also into the water. while in water, at the touch of a button the wheels fully retract and the craft transforms into a conventional speed boat. 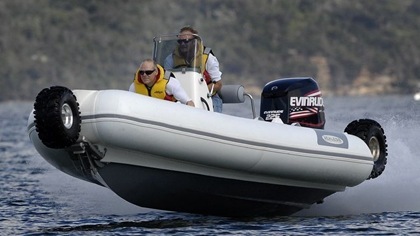 are having fully EPA compliant ‘clean technology’ outboard engines of up to 150hp. fuel tank is under the floor and has a capacity of 80 litres. speed on water: 30-35 knots. Sealegs boats are all certified to comply with CE category C, which is safe to operate up to 2 metre swells and Beaufort wind scale 6.
over 300 Sealegs amphibious boats are already in use in more than 14 countries worldwide. Here are some photographs of Sealegs Amphibious Boats. All the above photographs are from Sealegs gallery. 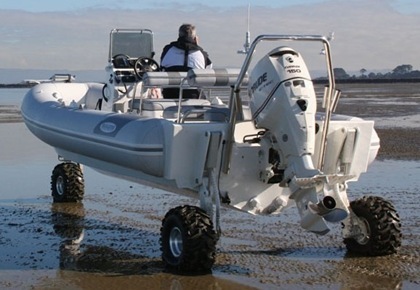 Here is an interesting 9 minutes video clip of Sealegs Amphibious Boats. 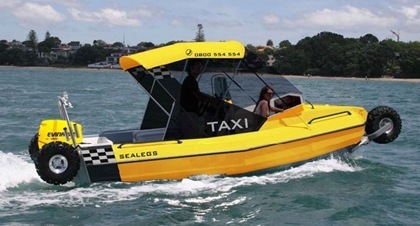 More details of Sealegs Amphibious Boats are here at Sealegs. Previous post: Worlds Largest Airship Zeppelin NT Sails in Combi Dock I to U.S.